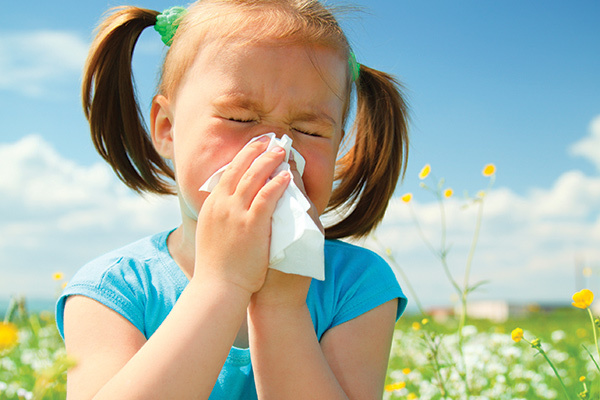 Kids Health: Seasonal Allergies - Your kids are sneezing, coughing, etc. Kids Health: Seasonal Allergies – Your kids are having sneezing fits, and cold-like systems —sneezing, congestion, and runny nose. Think it’s just a spring cold? It could actually be seasonal allergies. Colds and seasonal allergies have similar symptoms but generally happen at the same time every year. Often called “hay fever”, otherwise known as seasonal allergic rhinitis, are allergy symptoms that happen during certain times of the year, usually when outdoor molds release their spores, and trees, grasses, and weeds release tiny pollen particles into the air to fertilize other plants. An immune system of one that is allergic to mold spores or pollen treat these particles (called allergens) are treated by the body as invaders, and your body feels the need to defend against them. It’s the release of these invaders that causes allergy symptoms. Kids can be allergic to one or more types of pollen or mold. The type someone is allergic to determines when symptoms happen. For example, in some states tree pollination is February through May, grass pollen runs from May through June, and weed pollen is from August through October. That said, some kids with these allergies are likely to have increased symptoms at those times. Even kids who have never had seasonal allergies in years past can develop them. Seasonal allergies can start at almost any age, though they usually develop by the time a child is 10 years old and reach their peak in the early twenties, with symptoms often disappearing later in adulthood. If your child develops a “cold” at the same time every year, seasonal allergies might be to blame. Kids who have wheezing and shortness of breath in addition to these symptoms might have allergies that trigger asthma. Think your child may have allergies? Make an appointment today and we will find out.